Le Club AccorHotels has updated its list of select new hotels that qualify for quadruple points. You can earn quadruple points at these select hotels for stays between February 1 – March 31, 2016 that are booked this February. 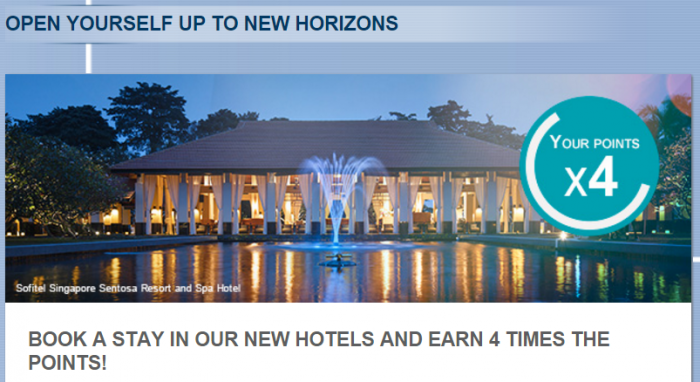 Note that Accor has made a mistake on the promo page for this offer. The hotels that are listed on the drop down menu are the ones for last month. The new list of hotels were listed (using codes) on the T&Cs and I have decoded them with real names. Good that I caught the incorrect hotel list that is on the drop down menu. When I was doing this piece, I suddenly thought that it was deja vu from last month (and indeed it was). So the hotels listed above are the correct ones. Earning quadruple points is a good reason to visit any of these properties if they turned out to be somewhere you need to stay at. Remember that you can combine these quadruple point offers with other bonus promotions that might be out there. 2. This offer is valid for a stay from 01/02/16 to 31/03/16 in one of the participating hotels (A0H6, A0I1, A0I7, A0H7, A0Q6, 7060, A159, 8886, 5175, 8649, 7080, 9781, A0A9, A026, A0E5, 9521, 7050, A0E7, 9964, 8529, 7133, A024, 8020), and booked between 01/02/16 and 29/02/16.